"What is a Yaba? And what does it do?" The Flintstones, an American animated television series produced by Hanna-Barbera Productions, is one of the most successful animated television series of all time. 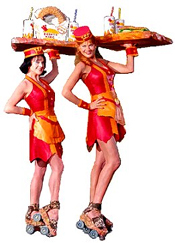 The Flintstones originally ran in American prime time for six seasons, from 1960 to 1966, on the ABC network. Originally, the series was to have been titled The Flagstones, and a brief demonstration film was created to sell the idea of a "modern stone age family" to sponsors and the network. When the series itself was commissioned, the title was changed, possibly to avoid confusion with the Flagstons, characters in the popular comic strip, Hi and Lois. After spending a brief period in development as The Gladstones, Hanna-Barbera settled upon The Flintstones. Aside from the animation and fantasy setting, the show's scripts and format are typical of a 1950s American situation comedy, with the usual family issues resolved with a laugh at the end of each episode. Although most Flintstones episodes are standalone storylines, the series did have a few story arcs. The most notable example was a series of episodes surrounding the birth of Pebbles. Beginning with the episode "The Surprise", aired midway through the third season, in which Wilma reveals her pregnancy to Fred, the arc continued through the trials and tribulations leading up to Pebbles' birth, and then continued with several episodes showing Fred and Wilma adjusting to the world of parenthood. When the decision was made in 1962 that the Flintstones would have a baby, the child was going to be a boy. Then they decided that a girl would make for better merchandising like dolls. A postscript to the arc occurred in the third episode of the fourth season, in which the Rubbles, depressed over being unable to have children of their own (making The Flintstones the first animated series in history to address the issue of infertility, though subtly), adopt Bamm-Bamm. Another story arc, occurring in the final season, centered on Fred and Barney's dealings with The Great Gazoo (voiced by Harvey Korman). The series was initially aimed at adult audiences as the first season was sponsored by the cigarette company Winston and the characters appeared in several commercials for Winstons. The famous theme song "Meet the Flintstones" was not actually introduced until the third season (19621963), although early versions of the melody can be heard as background music in many episodes. The show also contained a laugh track, which is still present in most episodes. The theme used for the first and second seasons, an instrumental called "Rise and Shine", was removed from all first and second season episodes in syndication from the 1960s through the early 1990s and replaced with the "Meet the Flintstones" opening, while a closing credits sequence taken from a later episode was substituted at the end. 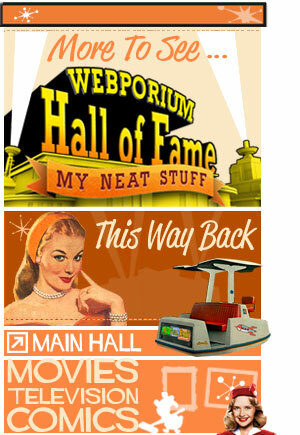 As a result, the closing credits for all first season episodes in syndication were incorrect for many years. New syndicated versions of the episodes in the 1990s restored the original first season credits and theme, albeit with cigarette and other advertising matter omitted. According to information provided on the DVD release of the second season, this decision was made because at the time syndicated programs were often aired out of their original broadcast order, and it was felt having the show jump between the different opening credits sequences would confuse audiences. Nonetheless, a number of later Flintstones episodes in syndication used an alternate version of the closing credits in which Pebbles and Bamm-Bamm are shown singing "Open Up Your Heart and Let the Sunshine In". Following the show's cancellation in 1966, a theatrical film based upon the series was released. The Man Called Flintstone was a musical spy caper that parodied James Bond and other secret agents. The movie was released on DVD in North America in March 2005. The show was revived in the 1970s with Pebbles and Bamm Bamm having grown into teenagers, and several different series and made-for-TV moviesincluding a series depicting Fred and Barney as police officers, another depicting the characters as children, and yet others featuring Fred and Barney encountering Marvel Comics superhero The Thing and comic strip character The Shmoo have appeared over the years. 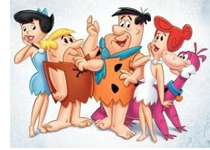 The show is set in a town called Bedrock in the Stone Age era, but with a society identical to that of the United States in the mid-to-late 20th century; in the Flintstones' fantasy version of the prehistoric past, dinosaurs, saber-toothed tigers, woolly mammoths, and other long extinct animals coexist with cavemen, who use technology equivalent to that of the 20th century, largely through the use of various animals. The characters drive automobiles made out of stone or wood and animal skins and powered by gasoline, although foot power is required to start the vehicles. Although the characters were set in the Stone Age, that never stopped the show's creators from producing a Christmas episode during the original series' run as well as several more Christmas specials in the decades that followed. 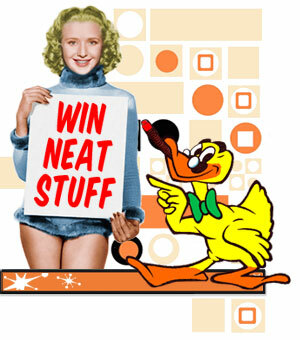 One source of the show's humor was the ways animals were used for technology. For example, when the characters took photographs with an instant camera, the inside of the camera box would be shown to contain a bird carving the picture on a stone tablet with its bill. In a running gag, the animals powering such technology would look directly into the camera at the audience, shrug, and remark, "It's a living," or some similar phrase. Another commonly seen gadget in the series was a baby woolly mammoth being used as a vacuum cleaner. 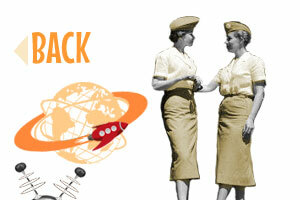 Travel to "Hollyrock," a parody of Hollywood, California, usually involved an "airplane" flightthe "plane" in this case often shown as a giant pterodactyl. (Other familiar place names are similarly contorted: San Antonio becomes Sand-and-Stony-o; the country to the south of Bedrock's land is called Mexirock; and so forth.) Elevators are raised and lowered by ropes around brontosaurs' necks; "automatic" windows are powered by monkeys that dwell on the outside windowsill; birds configured as "car horns" are activated by pulling on their tails. Being set in the Stone Age allowed for endless gags and puns that involved rocks in one way or another, including the names of the various characters being "rock" puns; some such names included celebrities such as "Rock Quarry", "Gary Granite", "Stony Curtis", and "Ann-Margrock." Other celebritiy/puns on the "Flintstones" were "Alvin Brickrock" (Alfred Hitchcock); "Perry Masonite" (Perry Mason); and a new neighbor lady "Sam" (Samantha) from Bewitched. The series directly drew from The Honeymooners for its main quartet of characters: the blustering Fred Flintstone and his ever-patient wife Wilma Flintstone (née Slaghoople, though Pebble was also given on occasion) modeled after the Kramdens, and their friendly neighbors Barney Rubble and wife Betty Rubble (née Betty Jean McBricker) modeled after the Nortons. Henry Corden, a friend of Jackie Gleason recalls: Jackie's lawyers told him he could probably have "The Flintstones" pulled right off the air. But they also told him, "Do you want to be known as the guy who yanked Fred Flintstone off the air? The guy who took away a show that so many kids love, and so many of their parents love, too?" And apparently Jackie thought it over and decided against it. Later additions to the cast included the Flintstones' infant daughter Pebbles Flintstone and the Rubbles' abnormally strong adopted son Bamm Bamm Rubble. The Flintstones had a pet dinosaur named Dino (pronounced DEE-no, and which barked like a dog), and the Rubbles had a kangaroo-like animal named Hoppy. Fred Flintstone worked at a stone quarry and worked for several different bosses, the best known of which was the bald Mr. Slate. In later seasons, the Flintstones cast expanded to include The Gruesomes, their strange next-door neighbors (inspired by the then-popular monster sitcoms The Addams Family and The Munsters), and The Great Gazoo, an alien exiled to Earth who helps Fred and Barney, usually against their will. It has been noted that Fred Flintstone physically resembled voice actor Alan Reed. The voice of Barney was provided by legendary voice actor Mel Blanc, though five episodes in the second season used actor Daws Butler while Blanc was recovering from a near-fatal car accident. The similarities with The Honeymooners included the fact that Reed based Fred's voice upon Jackie Gleason's interpretation of Ralph Kramden, while Blanc, after a season of using a nasal, high-pitched voice for Barney, eventually adopted a style of voice similar to that used by Art Carney in his portrayal of Ed Norton. In the show's closing credits, Fred tries to "put the cat out for the night" but winds up getting locked out and yelling for his wife to come open the door: "Wilma! Come on, Wilma, open this door! Willllll-ma!" By the time the theme song "Meet the Flintstones" was used, Fred cut the yelling to: "Willllll-ma!" Although the cat, Baby Puss, was seen in the closing credits of every episode, it was rarely actually seen in any of the storylines. This running gag of having the lead character of the series ending up being helpless during the end credits in every episode due to the hijinks of a family pet would later be repeated by Hanna-Barbera in the series The Jetsons in which George Jetson ends up being caught on a treadmill that ends up spinning out of control. He also (as does Fred in this series) cries out for his wife, by asking her to stop the mechanism with the line, "Jane! Stop this crazy thing!" The original show was also adapted into two feature non-animated films. 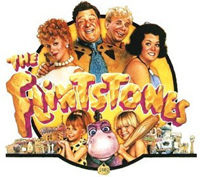 A 1994 'Univershell' (Universal) Studios live-action movie based on the animated series starred John Goodman as Fred Flintstone, Elizabeth Perkins as Wilma Flintstone, Rick Moranis as Barney Rubble, Rosie O'Donnell as Betty Rubble, Halle Berry as Fred's assistant Sharon Stone (according to pre-release publicity for the film, Sharon Stone was invited to play the role herself, but declined. 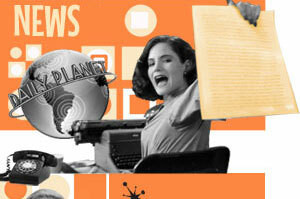 ), Kyle MacLachlan as Fred's evil boss Cliff Vandercave, and Elizabeth Taylor as Wilma's mother, Pearl Slaghoople. The film was directed by Brian Levant. Not critically acclaimed, the movie was still a box office hit. 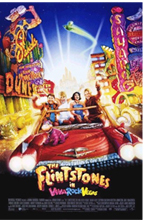 In 2000 a prequel to the first live action Flintstones film was produced by Amblin Entertainment and Univershell (Universal) Pictures. 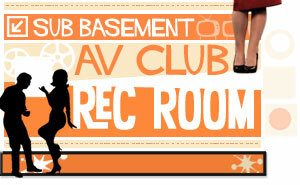 The Flintstones in Viva Rock Vegas was set before the Flintstones and Rubbles were married. 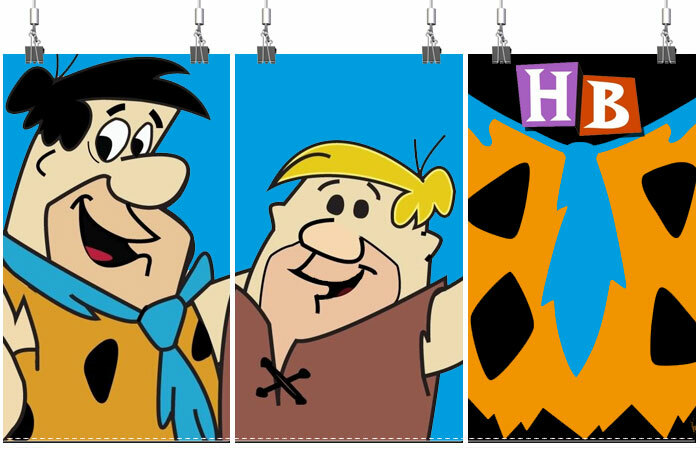 The film stars Mark Addy as Fred Flintstone, Stephen Baldwin as Barney Rubble, Kristen Johnston as Wilma Slaghoople, and Jane Krakowski as Betty O'Shale. Ann-Margret, whose appearance as 'Ann-Margrock' is one of the most fondly-remembered moments in the original TV series, sings the theme song, which is a slightly-rewritten version of the theme from Viva Las Vegas, in which Ann-Margret co-starred with Elvis Presley. Only the advent of The Simpsons decades later brought cartoons back to American prime time network television with the kind of success The Flintstones enjoyed. And it was The Simpsons in 1997 that ultimately broke The Flintstones' record as the longest-running prime time animated series. A number of episodes of The Simpsons made explicit or implicit references to The Flintstones - for example, in one episode of The Simpsons ("Marge vs. the Monorail") the starting sequence parodies the opening and theme song of The Flintstones, in "Homer's Night Out", Homer states to Apu "sorry, buddy, you've got me confused with Fred Flintstone", and in episode ("Treehouse of Horror XII") Homer and Marge Simpson dress as Fred and Wilma Flintstone in the opening. Another episode ("Lady Bouvier's Lover") has Mr. Burns greeting Homer, Marge and Maggie as Fred, Wilma, and Pebbles. Homer subsequently says "Yabba Dabba Doo!" when Mr. Burns gives him a box of chocolates. One episode's couch gag even featured the Simpsons running in and finding The Flintstones (as they were originally animated) sitting on the Simpsons' couch.